I seem to have quite an obsession with mists lately. First there was M.A.C Fix+ Rose. Then I moved on to Givenchy Mist Me Gently Instant Moisturizing & Relaxing Mist. And then I rediscovered my Molton Brown Relaxing Yuan Zhi Sleep Mist. Now, you must be wondering why I bring all of those up. Well, fellow beauty chicks, I've gone and discovered the holy grail when it comes to mists. I'm talking about La Mer The Face Mist. Stressed? Spritz on The Face Mist. Skin looking a little peaked from traveling? Spritz on The Face Mist. Protecting against daily pollutants and even the horrible fluorescent lighting in your office? Go ahead, spritz on The Face Mist! This delightful bottle does it all. The lavender-hued mist revitalizes, hydrates and soothes even the driest skin, making it look refreshed and recharged in just seconds. I'm sure you're wondering how this can work. The Mist is formulated with marine and botanical extracts, vitamins and minerals to restore comfort to the complexion. It also contains a live internal magnet, which acts as floating energy to continually charge the ingredients within. Creating a negative-ion-rich environment, it keeps the ingredients potent and boosts skin's energy level instantly. I've been keeping The Mist at my desk for those times when I just need a quick pick-me-up. Its fresh, crisp fragrance keeps me awake and alert -- and it's perfect after a long meeting! 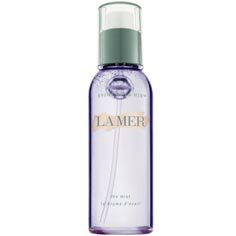 La Mer The Face Mist retails for $55 at blissworld.com.